Thinkpad T61 ND115GE 14" WXGA T7700-2,4 2GB 100GB-7200 DVDRW FP VistaUltimate 3J.Gar. Thinkpad T61 14,1" SXGA+ CTO T7500 2GB 120GB NVidia-NVS140 6c XP 3J.G. Dell Precision M2400 Solid 14,1'' WXGA+ LED P9500 4GB 320GB-7200 FX370M 6c WinXP 3J.VorOrtGar. Thinkpad T61 UI02BGE 14" SXGA+ T7300-2,0 2GB 120GB DVDRW FP *XP-prof.* 6c. 3J.Gar. 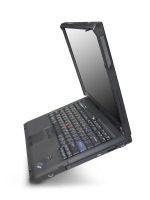 Thinkpad T61p CTO 14,1" SXGA+ T9300 2GB 160GB-7200 NVidia-FX570M 9c XP 3J.G. Thinkpad T61p UI03FGE 14" SXGA+ T7700-2,4 2GB 100GB-7200 NV-FX570M 9c VistaUlt o. XP 3J.Gar. Dell Precision M2400 Silent 14,1'' WXGA+ LED P9500 4GB 128GB-SSD FX370M 6c WinXP 3J.VorOrtGar. IBM Thinkpad T61p UI03DGE 14" SXGA+ T7700-2,4 2GB 100GB-7200 NV570M 9c VistaUlt o.XP 3J.Gar. Thinkpad T60p UT48JGE 14" SXGA T7600-2,33 4GB 100GB-7200 DVDRWD L BT FP XP 3J.Gar.